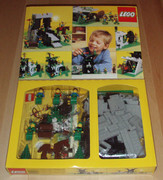 Ah my first Forestmen set as a young lad. Oh the memories. But then I am a sucker for anything from this line. I never owned this set (nor any other forestman set, I grew up mostly on Fright Knights, Ninja and above all the KK I line) but it looks really good and I was contemplating buying it the other day because I realized I have too few civilian figs (and forestmen are quite ideal to represent hunters) and could use the vegetation, as well. My dad was able to get the set off ebay several years ago and I also agree it's an amazing set. Love the forestmen, and the simple-looking style was and still is a very gratifying set to build and play with. I really wish that Lego would make another forestmen/dark forest theme, with the old outlaws and common peasants... I can only hope I guess. I remember losing my 12 year old mind when this came out. Had to mow quite a few yards to get the money for it, but it was (and is) totally worth it. Still one of my all time favorite sets. The build is a lot of fun as it is a uniquely designed, fully-enclosed structure. The rolling rock door, hidden larger door, and tree tower are fun design elements that not only give the structure lots of play value and aesthetic appeal but also establish the new faction's character. Lots of useful parts included. Among the abundant great bits are black 1x5x4 arches, small and large leaf elements, 2 small trees, 6 minifigures <1 unique>, 18 plumes in 4 colors, weapons, brown horse with saddle, and 8x16 and 16x16 baseplates. Even the packaging is great. I have a special nostalgia for the vintage Legoland castle packaging with its strangely pleasing yellow background, and sets with with flip lids and windows even moreso. This set pushes all those buttons for me; I remember holding the boxed set, the horizontal rectangle shape, the bonus ideas on the inner lid and back and alternate main model images on the smaller sides : all reminiscent of the 383 I remember coveting but not getting (until adulthood and ebay came along). I can still see the illumination/calligraphy around the C in Camouflaged Outpost and recall the excitement of looking at the carefully arranged colorful forestman waiting to be released from their tray onto my Lego world. The set was and is still a 10. Two clear trays also come with "different" boxes of slightly different dimensions. Last one in blue is Canada Samsonite packaging that also exists in gray. I am sure it is no longer feasible/cost effective, but that see through pane in the box is sweet. Wish we would see something Iike this again. Lots of minifigs, a horse, great pieces, nice foliage, lots of weapons... What's not to love? The owner said that he couldn't even remember when he got it. It should had been ages as he said. The condition was really nice, only tiny scratches on the plastic vitrine. So i got the chance and got it in a really low price. It contains the 6066 Camouflaged Outpost and 6085 Black Monarch's Castle.All the pieces are glued exept the minifig weapons. The plastic glass can be removed. I tried to find some information about this item on internet but didn't find anything. I am sure this is an official LEGO item. If someone could tell me some informations for this item would be perfect. SSchmidt wrote: I am sure it is no longer feasible/cost effective, but that see through pane in the box is sweet. Wish we would see something Iike this again. I was a big fan of the flip-top boxes like that too--it was the mark of buying a "big" set when it came with that. While I appreciate the cynicism, I think the extra cost in making the flip-top cases is by far the more important concern.